Melody joined the Native American Rights Fund (NARF) as a staff attorney in 1986. 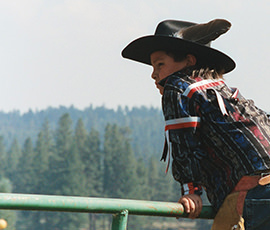 At NARF, Melody has worked primarily in the areas of jurisdiction in Indian country, tribal rights in education, tribal intellectual property rights, and tribal trust funds. Melody is a past Co-Chair of the Federal Bar Association’s Indian Law Conference, 1990-1992. She served as President of the Colorado Indian Bar Association from 1990-1992, and a Board Member of the American Indian Bar Association (now the National Native American Bar Association) from 1990-1991. She was a member of NARF’s Litigation Management Committee (LMC) from 1992-1995, and since May 2007 she again has been serving on the LMC. Melody received her undergraduate degree from Harvard University (1981) and law degree from the University of Michigan (1986). She is admitted to practice law in Colorado and Massachusetts. She has practiced before all levels of tribal and federal courts, including arguing a case before the U.S. Supreme Court. Melody is an enrolled member of the Cherokee Nation of Oklahoma. See Melody’s resume to learn more about her experience and credentials.